I don’t think it’s a revelation to say that trees have character, though some more than others. Even evergreens can have character. But that character is revealed more to us during the months when they are not fully covered in leaves. During the time when we can easily see the trunks, limbs and branches, they form a myriad of interwoven lines and curves that at times can create an intricate abstract design. Sometimes we don’t initially see those designs because of our relative position, but move around a bit and you might discover an interesting interplay of elements that form a unique composition that was always there, just waiting to be seen. Sometimes they pop out easily while other times they are more delicate and require a bit more “vision” to see them. The image at the top was one that seemed to jump out as I drove by. Initially it was in the shade of overhead clouds and I tried several different compositions. When I thought I had captured what I wanted, having thought how fortunate I was that the scene was in shade and evenly lit, I packed up my gear back in the car and was about to drive away when the sun came out. Suddenly the same scene was dramatically different!! I quickly got the camera out again, set up and was able to click off a few shots while the sun played peek-a-boo. 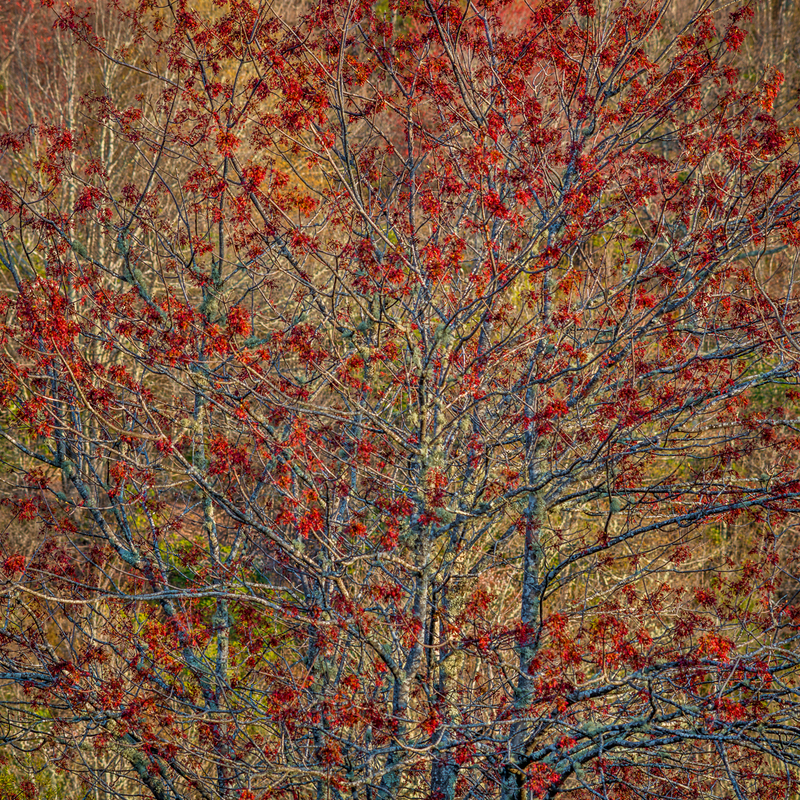 The backlit red maple buds really popped out against the green moss on the tree limbs before them and the blue tinted hillside behind. There is no secret where your attention is initially focused, yet the scene constantly changed as the sunlight and shade drifted through leaving the red buds backlit or in shade. The best was when the background hillside was in shade while the buds and moss were sunlit. But this was a circumstance where the quickly changing light precluded combining multiple parts of the scene into one later that was discussed in the previous post. However, in the second image, things are a bit more subtle; colors are muted because of the strongly filtered sunlight. The small circle formed by the branches near the center would not be there if the camera position were moved much, while the diagonal line of yellow adds an additional path to follow through the frame. Though all the images in this post are not technically abstracts because the subject can easily be determined, each is strongly influenced by color, line and texture; the design itself is the star of the image rather than the subject. The search for abstracts can be enjoyable in an otherwise “chaotic” scene, and can also serve as a way to practice composition and balance within the frame, two elements of photography whose importance cannot be overstated. As I mentioned in the last post, there weren’t any clouds for most of the time on this trip along North Carolina’s Blue Ridge Parkway. There were only a few along the horizon at sunset, but none each day at sunrise. So there were no opportunities to photograph an incredible sky lit up by the sun as I was fortunate to do two falls ago. But that doesn’t mean you pack up and go home…you try to work with the conditions you’re presented with. Each morning I went to the ever popular Pounding Mills Overlook, but things didn’t work out. 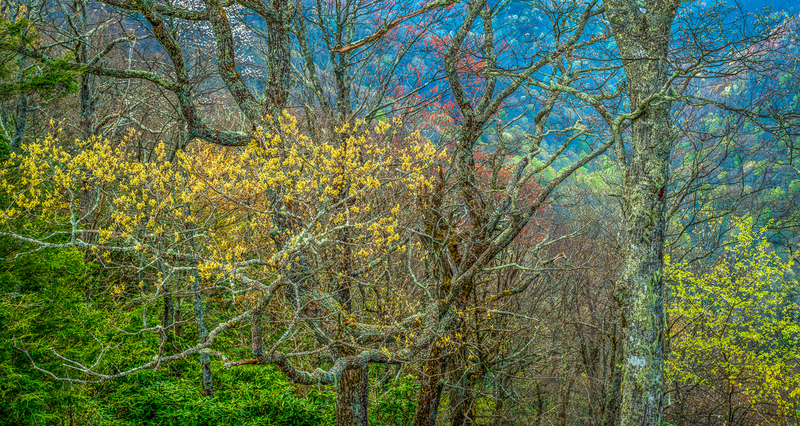 The first morning, instead of a boring and cloudless sunrise, I took a forest detail panorama (below) pitting the cool blue morning light just before sunrise against the warm yellow spring buds using a short telephoto. After the sun rose a bit and cast it’s light across the valley below, I used my normal 50mm lens in portrait and clicked off three frames to include Looking Glass Rock in the upper right to create a more normally cropped scene that benefits from the increased resolution. Hoping for some clouds on the second day at the same location, I was shut out again, so just before the sun rose, I hurried further down the parkway to an overlook just before Graveyard Fields to see if the view from there would be any better for a cloudless sky. I ended up taking a set of two overlapping images with the normal 50mm again to really get some fine detail in the closest hills in the image at the top of the post. It turned out I liked the framing of the hills on each side since there were no clouds and I could concentrate more on the graphic nature of the ridgelines going off in the distance. If there were clouds lighting up, then I might have used a 35mm to include the sides and panned up for the second (or third) shot to get more sky and combined them later into a vertical image. My very first attempt of the trip at a forest detail panorama was on the opposide side of the road from the Cherry Gap Overlook. There were some interesting trees and buds and it was easy to see through the trees across the valley since they had not yet leafed out. What allowed me to take that shot was that, although it was mid afternoon, there were some clouds overhead which covered the sun to put the entire scene in shadow. In addition, the winds were pretty calm and I was able to snap off a few frames and not worry about blurry branches from movement and relatively slow shutter speeds. Here the light values were pretty consistant while in the image below, there was a lot of contrast between the backlit buds and shadows. A polarizer helped with the glare from the leaves and really saturated the colors; using a polarizer is almost a must when taking backlit images. In most cases, about a full stop of underexposure is needed to accurately render the leaves in an image like the one below. Almost two stops of underexposure is needed when taking shots of just a few leaves with a lot of shaded area behind them, I needed to boost the ISO to 800 for the image below in order to get a shutter speed fast enough to stop movement since the branches were in almost constant motion from a steady breeze. The big advantage of combining images is the greater resolution. If you look at them in Lightroom at 1:1 magnification, the detail is astonishing. Prints can easily be enlarged to several feet wide while maintaining clarity. So if time allows, try several images to combine into a single; whether it is a true panorama or just a normally cropped image. But understand that circumstances do not always allow the time necessary to go through this process because of quickly changing conditions. But it’s just another tool to create better images that are more crisp, clean and sharp. 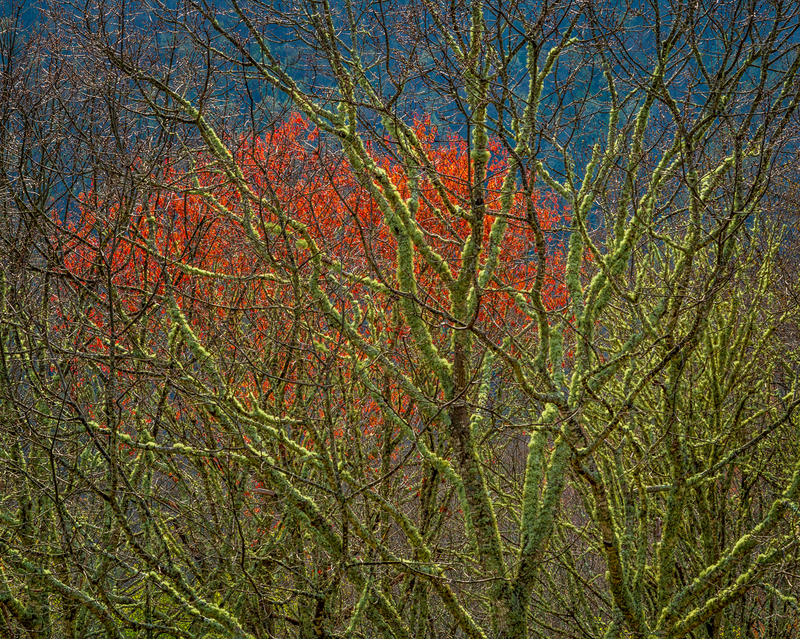 On either side of winter are probably the two most anticipated seasons for photographers. And for good reason. 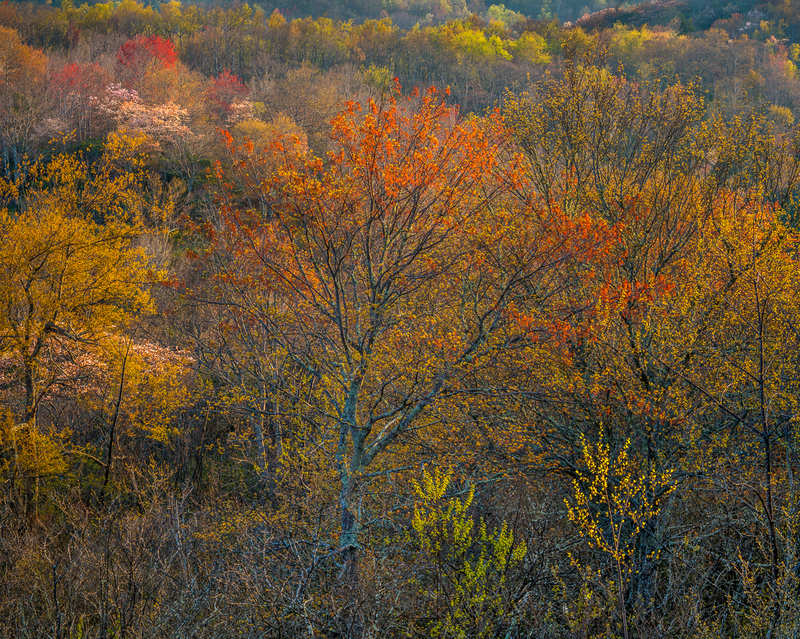 The wild colors of autumn or the buds and flowers of spring make for visually appealing imagery, while milder temperatures make photography a bit more comfortable than the frigid weather in winter and sweltering summer. But even more specifically, within those seasons, there are times when trees show their bones while still retaining a few leaves in the fall or before they have leafed out in the spring. The visible branches and trunks add a level of character that fully leaved trees generally lack, and if buds are just beginning to sprout, then it’s icing on the cake. These are the times I try to be out shooting. 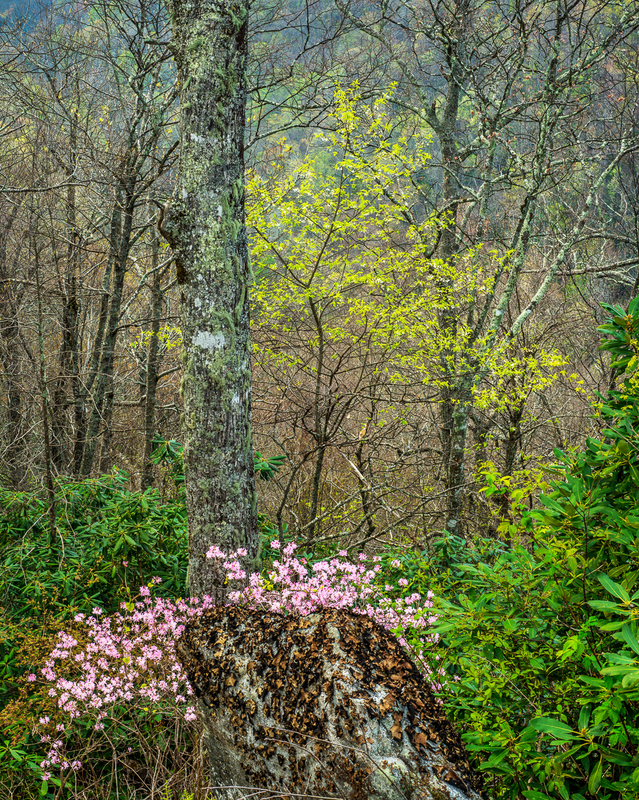 In the hardwood forests of the east, it’s almost a toss-up on which season is better, and in some respects, spring can easily be as colorful as autumn. 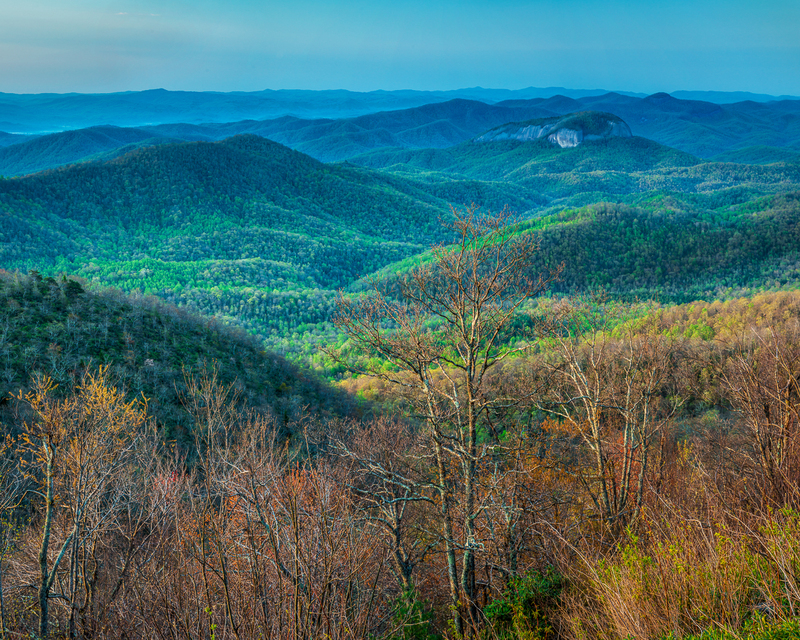 I recently spent a few days along the Blue Ridge Parkway in North Carolina and came away really loving the spring. There are so many different flowering trees and bushes at various elevations along with what seems like an endless variety of flowers carpeting the forest floor. The trees themselves can be beautiful in full sunshine as well as cloudy weather and the flowers on the forest floor can be photographed early or late in the day when in shade, or use a sunshade (umbrella) or reflector if they are in sun to cut down the contrast. Although the forest colors can really come alive just after a rain, unfortunately there was none during my short time there. It can also become very mysterious when cloaked in fog and if the breezes are gentle, it can be magical. Again there was none. But sunshine can also be your friend. By using the sun to backlight the spring buds, and using an opposite hillside in shade as the background, the light is nothing short of amazing. On the clear days of this trip, I did a lot of driving to find these spots but by mid-morning, most everything was in sun and more difficult to find. That’s a good time to scout sunset/rise locations with a compass, have lunch or take a nap to revive after getting up very early to catch a sunrise. Then as the afternoon progresses, more locations open up for these backlit situations. Some spots that were front lit in the morning will now be backlit, so even if you follow the same road in the opposite direction you traveled in the morning, an entirely new world of possibility opens up. 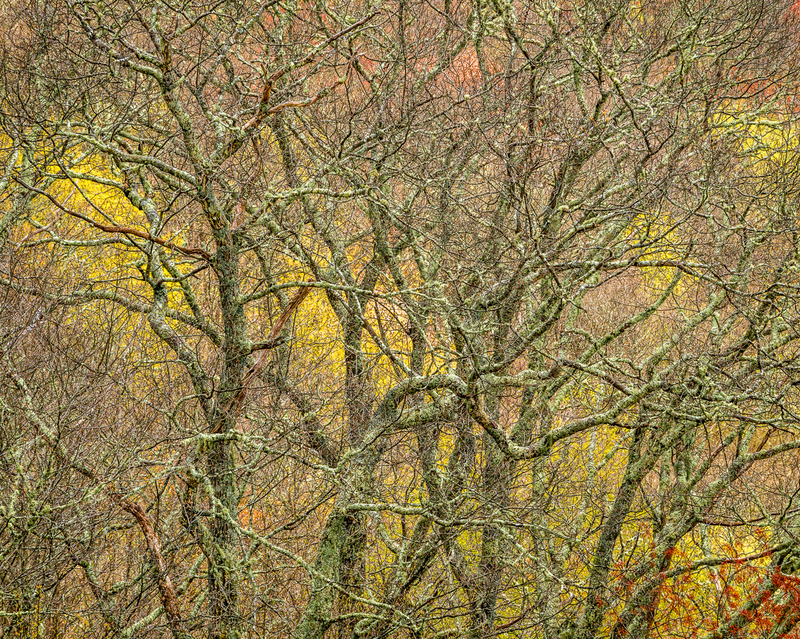 One thing to keep in mind when composing an image of the “chaos” within a forest: try to include something that will immediately attract the eye of the viewer first before exploring whatever else is contained within the frame. Without that focal point that grabs their attention, the viewer’s eye will wander helplessly, searching for something on which to rest their gaze. You must determine what you want the viewer to see first, and then afterward, direct them through the frame. What you choose to include or exclude will help the viewer explore your photograph as you intended. This point is clearly illustrated in the image from Soco Gap. The three evergreen trees are what draws the eye immediately before going to the larger deciduous trees nearby, and then beyond to the more distant hillside trees. Throughout the hillside are worlds to explore as you examine them more closely. This is where the added detail of panoramas can play an important role. 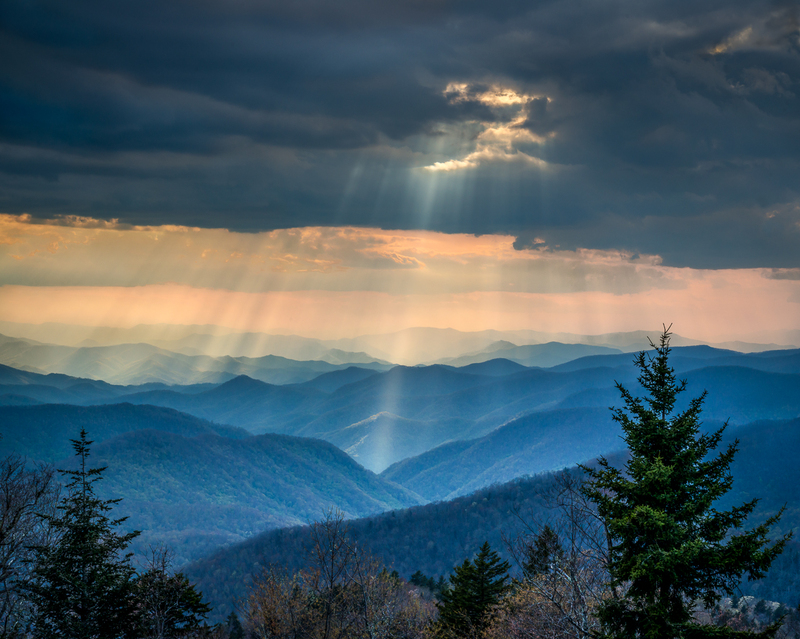 With the addition of panoramas in the toolbox, you can really enjoy the possibilities of using long swaths of a hillside or a forest detail to create ultra-high resolution images that can be printed in very large sizes while maintaining a sharpness that would not otherwise be possible. The panorama technique can also be used to simply create a normally cropped image from several individual shots. For a horizontal image, simply flip the camera into the vertical or portrait position and combine two or three images across the scene to create a single high-res photo later on your computer. You’ll have at least twice the information available to create a print that could have been done with one horizontal shot. The same for a vertical image: flip the camera to the horizontal or landscape position and take a few shots panning up or down. I’ve found that if you use a normal or longer lens for your particular camera (full frame or crop sensor), there is no need for any special tripod head. In fact, I’ve found that going through all the work of precisely leveling the tripod was more trouble than it’s worth because even with the camera level as per the horizon leveling option on some of the cameras today, as the head rotates or pans, it drifts either up or down. So if you have a ball head, just set up the first shot and take it, loosen the head and rotate while using some mark within the frame to overlap about a third and to be in the same relative position from the top or bottom of the frame and you’ll be fine to stitch them together in Photoshop or whichever software you use to do so. Using this technique has most times created very little in the way of those curved “lost areas” that stitching sometimes produces. Those small blank areas can then be filled in easily by either distorting the image or, in the case of something like the continuous tones of a sky or still water, filling them in with the clone tool. The practice of using multiple images to create one final shot really helps when trying to capture fine detail, whether it’s the brilliant colors of each autumn leaf, the buds of a forest in spring or anything else that benefits from the added detail. And it can be used during any season you decide is your favorite…which for me, is usually the last one I photographed.